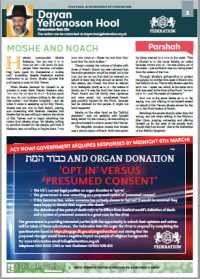 Hashem commanded Moshe Rabbenu, “ לך רד כי שחת עמך עשו להם עגל מסכה – Go down, for your people have become corrupted, they have made for themselves a molten calf.” Incredibly, despite Hashem’s explicit instruction to go down, Moshe ignores this and begins to pray for Klal Yisroel. 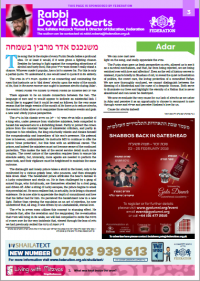 The annual seudah of the Federation chevrah kaddisha on 7 Adar was held this year at the Yeshurun, Edgware. The seudah was attended by members of the chevrah kaddisha, representatives of the Federation’s shuls, Dayanim, Rabbanim and askanim from across the kehillah. Despite the large crowd, there was a tremendous feeling of achdus in the room. 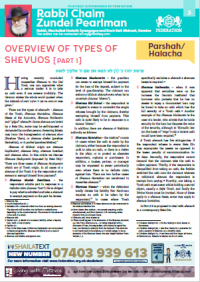 As guest speaker Rabbi Meilech Schwartz pointed out in his address, a different selection of the chevrah is convened for each taharah, so that all the members know and feel close to each other. Similarly, their supporters from local shuls as well as of the centralised organisation feel much warmth and gratitude toward the dedicated chevrah kaddisha. This week, the Federation published a history of Edmonton Cemetery. 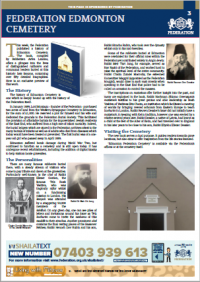 The book, compiled by Rebbetzen Aviva Landau, offers a glimpse into the lives of distinguished rabbonim and communal leaders buried at this historic beis kevaros, containing over fifty detailed biographies. Here is an exclusive preview of this work. The song that is the staple of every Purim Seuda belies a profound idea. Or at least it would, if it were given a fighting chance. Besides for having to fight against the competing attractions of alcohol and tasty food, this poor מאמר חז”ל doesn’t really stand a chance. Whoever made it popular, has a lot to answer for. For this is only a partial quote. To understand it, one would need to quote it in its entirety. The biblical oath was taken with the expression of the Divine Name whilst holding a Sefer Torah. Rashi1 comments, that because of the severity of such an oath, the Rabbis of his generation avoided these types of oath and replaced them with a less severe declaration of a penalty of a curse for swearing falsely. The Ritvo disagrees and said the biblical oath is more of a deterrent to lying and should therefore be used. 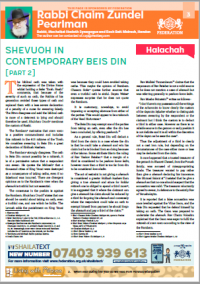 Shulchan Oruch2 mentions the custom of Rashi.